Britain wanted to be seen as contributing to the defeat of Japan in the Pacific War, so the Royal Navy's Fleet Air Arm (FAA) began operations there in January 1945 under the overall command of the U.S. and continued until the war's end in August. All five aircraft carriers of the British Pacific Fleet (BPF) that participated in battle action off the Sakishima Islands between Okinawa and Taiwan were hit by at least one kamikaze aircraft between April 1 and May 9, 1945. The Japanese kamikaze attacks from bases in Formosa on the British carriers Formidable, Illustrious, Indefatigable, Indomitable, and Victorious killed a total of 44 men and wounded 83. 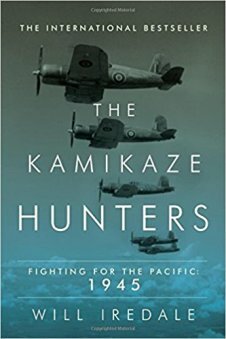 Despite the title of The Kamikaze Hunters, only 4 of the book's 19 chapters cover the British Pacific Fleet's fighting off the Sakishima Islands where their primary mission was to put out of action the six airfields on Ishigaki and Miyako Islands (also known as Ishigakijima and Miyakojima) and hunt down Japanese kamikazes in the air and on the ground. 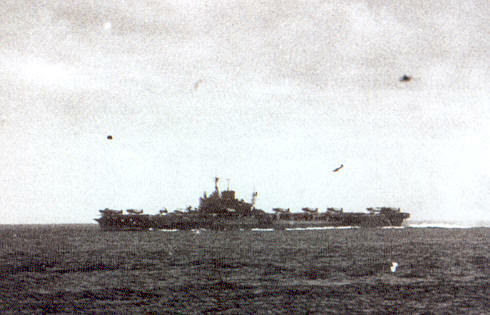 The British Pacific Fleet protected the American's fleet left flank from kamikaze attacks that originated from Formosa or from Ishigaki and Miyako Islands. Britsh airmen shot down 42 Japanese aircraft while off the Sakishima Islands and claimed another 100 destroyed on the ground. This focused history covers the Royal Navy's Fleet Air Arm activities from the beginning of World War II. Action in the Pacific does not start until about halfway through the book, with the first half covering training, including flight schools in Canada and the U.S., and action in Europe such as the operation to destroy the German battleship Tirpitz hiding in a Norwegian fjord. The book's last half describes the British Pacific Fleet's three primary operations: bombing and strafing of Japanese oil refineries in Palembang on Sumatra Island in January 1945, airfields on the Sakishima Islands from March to May 1945, and airfields on Japan's main islands from July to August 1945. The British aircraft carrier pilots primarily used American-produced Hellcat and Corsair fighters along with British-produced Supermarine Seafire fighters. Will Iredale, former news reporter for The Sunday Times, put together a very readable history of the British Pacific Fleet. He conducted many interviews with veterans to provide stories missing from official histories. Background information, especially is the first half, sometimes slows down the narrative, but Iredale shows in his first published book great skill in telling thrilling stories from the three major operations at Palembang, Sakishima Islands, and the main islands of Japan. The book contains useful documentation with a bibliography, extensive notes and references, and an index. There are 38 historical photographs in the middle of the book. The front of the book provides valuable maps of the locations of the carriers during the different operations off the Sakishima Islands and the main islands of Japan. Two other books, Kamikaze: The Story of the British Pacific Fleet (1991) edited by Stuart Eadon and Wings Over Sakishima (2010) by Fredio Samples, cover the kamikaze attacks on the British Pacific Fleet off the Sakishima Islands, but The Kamikaze Hunters far surpasses these two for interest to a general reader. The steel flight decks of the British Pacific Fleet's aircraft carriers allowed them to avoid serious damage when Japanese kamikaze aircraft and their bombs crashed into them, although the attacks caused many casualties. For example, the two photographs at the bottom of the page from May 4, 1945, show a Zero fighter carrying a bomb hitting the carrier Formidable, which caused 8 deaths and 47 men wounded. However, the flight deck was quickly repaired, and the carrier landed planes again by the end of the day. The British lost 105 airmen in enemy action during the eight months they fought in the Pacific War. At least 10 were executed after being shot down, but most were killed by anti-aircraft fire during strafing runs and bombing raids. With many examples of courage and heroism presented in this book, the Royal Navy's Fleet Air Arm must be recognized for their significant contributions to victory in the Pacific War. 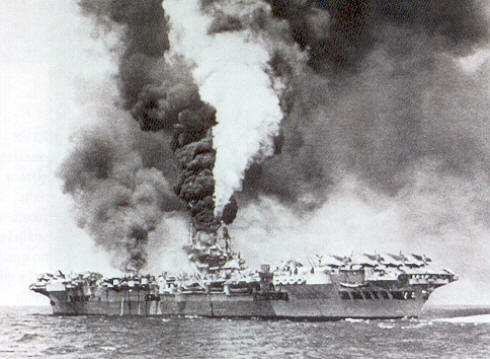 deck on May 4, 1945. Attack killed 8 men and injured 47.